In advance of the High Holidays and with students returning to school, UJA Federation of Greater Toronto and the Centre for Israel and Jewish Affairs (CIJA) recently held a comprehensive security training session for staff and volunteers in the Jewish community who have security-related responsibilities in their community institutions. The briefing took place at the Lipa Green Centre. 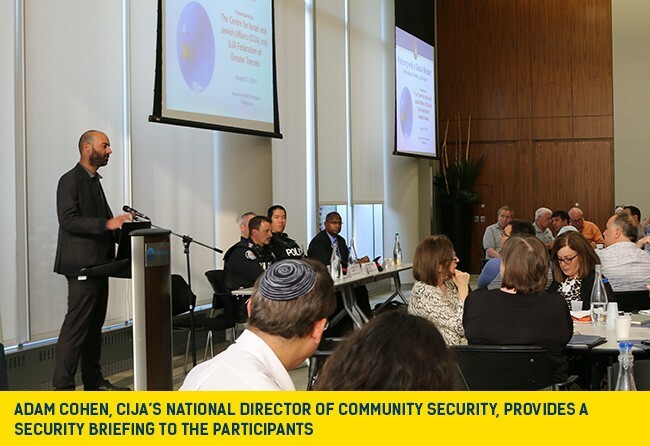 Approximately 120 staff and volunteers from Jewish institutions across the Greater Toronto Area, including JCCs, schools and synagogues attended the session and were provided with an all-encompassing security briefing and training opportunity conducted jointly with Toronto Police Services and York Region Police. Among the topics covered were: how and when to report an incident; how to secure an institution, hate crimes and their impact on the community and how these crimes are processed by law enforcements and how to profile behaviours and situational awareness. CIJA, along with UJA, are working closely with our partners in law enforcement to ensure police visibility around Jewish institutions and neighbourhoods during the upcoming High Holidays. In addition, CIJA Security conducted audits, staff security briefings and lockdown drills at numerous Jewish day schools throughout the summer.